Different Compression Ratios and Ring Packages Available. 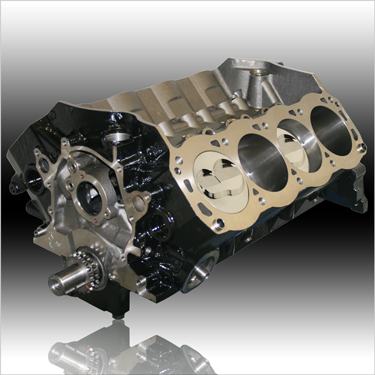 Our 427 Ford Sportsman Race Engine Is Now Available In Short Block Form! Different Compression Ratios Are Available - Look At The Following Chart And Let Us Know What Heads You Are Using And We'll Do The Rest! (1) Block Requires 1/2" Head Bolts or Head Studs. (2) Neutral Balance Flexplate/Flywheel and Harmonic Balancer Required. Includes: Custom Steel Billet Solid Roller Cam, Cloyes Roller Timing Set. Camshaft Installed, Degreed-In and Checked For Proper Stroker Clearance. Includes: Custom Steel Billet Solid Roller Cam, Cloyes Roller Timing Set w/(2) Piece Fuel Pump Eccentric, OEM Style Front Cover, SFI Hi-Performace Balancer and Billet Pointer, Canton Sportsman Series Race Pan w/Baffle*, Melling HP Oil Pump w/Pickup, (1) Piece Silicone Oil Pan Gasket w/Steel Grommets. Completely Assembled With TDC Verified and Set. *Must Specify Front or Rear Sump.